ISB aims to provide access to high standards of education to external candidates who cannot meet the expense of a private international school, thrive academically and have an impeccable conduct, live in Bucharest. The ISB Scholarship Programme’s objective is to grant full or partial scholarships to eligible students who cannot meet the expense of the ISB education. External candidates age 14 and 16, at the start of Year 10 and Year 12. The scholarship will cover the IGCSE Programme (Year 10 and Year 11) and the IB Programme (International Baccalaureate Programme – Year 12 and Year 13). 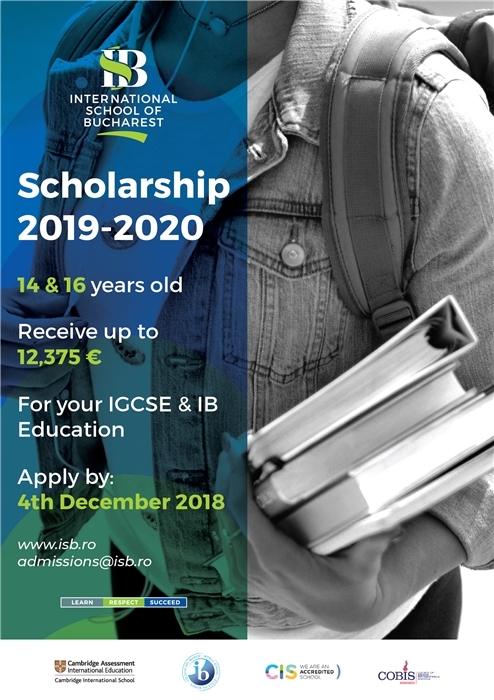 Applications can be submitted by email to admissions@isb.ro by 18th December 2018. All selected candidates will be announced by 14th January 2019. Candidates who meet the academic criteria will be invited to school for an interview by the committee. Copies of all siblings birth certificates. Applicants who fail to provide all necessary documentation by the appropriate deadline will be disqualified and will be informed of the specific reason for ineligibility. The committee will make the final decision whether a scholarship will be awarded for the academic year 2019/2020 and what the value of the scholarship will be by 15th February 2019. Following the student’s acceptance in to the scholarship programme, a contract needs to be signed between the school and the parents and the ISB admission procedure needs to be completed.